The author Samaresh Majumdar was born on March 10, 1944 in the tea garden of Duars, Jalpaiguri, Uttar Banga. His written first story published in Desh patrika in 1967 and frist novel 'Dour (run)' published in 1975 at the same patrika. After then all of his ageless novels have created a new trend in Bangla literature. He has occupied popular places in the reader society by his creative writing power and other talents. His notable books are- Dour, Ei Ami Renu, Agnirath, Uttaradhikar, Bandinivas, Oisharjo, Boro Pap He, Ujan Ganga, Manusher Maa, Basbhumi, Lakshir Pachali, Unish Bish, Chayar Shareer, Swaoal, Kalbela, Kalpurush, Swopno Shondhani and many more. 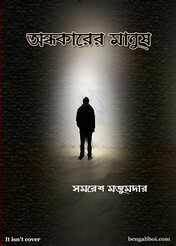 Now you can collect another popular book of his written- Andhakarer Manush.